In 1992, Reno was in a small recession. The Reno area had not quite started its economic boom that was to come. I was just laid off and there was a shortage of jobs. My wife had to quit her job because of pregnancy complications and we had a four year old son. What do I do now? It was very similar to what is happening to many families today. I tried my hand at odd jobs until "the one" would come in, but "the one" seemed to never come. I decided to try my hand at janitorial and thru speaking with old clients I started to get contracts. It worked! I started with small jobs and I was thinking I would only do this until "the one" job came along. Little did I know at the time I was with "the one." I started with the typical household equipment and hard work. Putting some extra food on the table was great! Eventually, we needed a van and we bought a "starter" van, a 1967 VW bus. No heat and no A.C. Going to work in the winter was cold! There were many times we had to push start that van. 'Thank you!' to those employees who helped to get that VW going so we all could have a job. 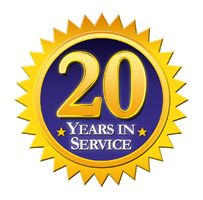 We eventually received our first big contract, which we still have as clients after over 20 years. Thank you, Keystone Square, for giving the little guy a chance. At this point I was doing financially better than I had at any other job and realized this was "the one." But it was quite humbling; going from the executive world to a being a janitor. I worked many long hours, but we were determined to succeed. There were so many fun, aggravating, fearful, and joyful memories. Xtraclean Janitorial is now a full service janitorial company serving the Reno, Sparks, and Carson City area. Xtraclean currently has thirty-one employees and four vans. I pray we will get through this recession; for now Xtraclean has a bigger family to keep employed. My wife and I had another son and they are now 23 and 19, and currently employed with Xtraclean while going to college; waiting for, "the one." We want to thank all our clients, vendors and employees for helping us reach our dreams.